Fellow Svengoolie SvenPals and enthusiasts of vintage Universal Studios monster thrillers will be excited about his upcoming presentation of a 1941 classic. The iconic Chicago/Berwyn-based horror film host will present “Man-Made Monster” (1941), this Sat., June 16 at 8 p.m. Eastern/7 p.m. Central on Me-TV. “Man-Made Monster” was directed by veteran film director George Waggner. Around the same year that “Man-Made Monster” was released, Waggner directed another landmark Universal monster feature, “The Wolf Man” (1941). During the latter part of his career, Waggner directed 10 episodes of the live-action “Batman” TV series with Adam West and Burt Ward from 1966-67, according to IMDB. This will mark Sven’s third airing of “Man-Made Monster” (1941) on Me-TV. He previously showcased Waggner’s Universal monster/sci-fi shocker back in May 2015 and Sept. 2016.
Who was in “Man-Made Monster” (1941)? 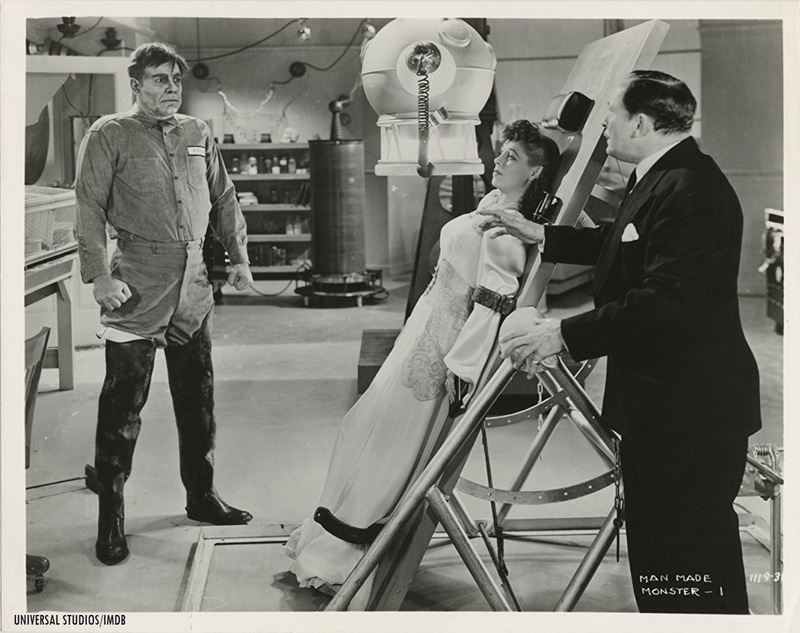 The players who appeared in “Man-Made Monster” were Lon Chaney Jr. (as Dan McCormick), Lionel Atwill (as Dr. Paul Rigas), Anne Nagel (as June Lawrence), Frank Albertson (as Mark Adams), Samuel S. Hinds (as Dr. John Lawrence), William B. Davidson (as Dist. Attorney Ralph B. Stanley), Ben Taggart (as Detective Sergeant Regan), Constance “Connie” Bergen (as a nurse), Chester Gan (as Wong), Frank O’Connor (as a Police Detective) and George Meader (as Dr. Bruno). The junior Chaney would also appear in the title role of Lawrence “Larry” Talbot/The “Wolf Man” in Waggner’s hit Universal monster feature, “The Wolf Man” (1941, with Bela Lugosi, Claude Rains, Ralph Bellamy, Evelyn Ankers, Warren William and Patric Knowles). One year before “Man-Made Monster,” Anne Nagel played the role of Jean in the fifth film of Universal Studios’ “Invisible Man” franchise, “The Invisible Woman” (1940, with Virginia Bruce, John Barrymore, Charlie Ruggles, Shemp Howard, Margaret Hamilton and Oscar Homolka). Lionel Atwill appeared in numerous Universal monster features throughout his acting career, including “Son of Frankenstein” (1939, as Inspector Krogh), “The Ghost of Frankenstein” (1942, as Dr. Theodore Bohmer) and “Frankenstein Meets the Wolf Man” (1944, as the Mayor). Both Frank Albertson and Samel S. Hinds later appeared in Frank Capra’s Christmastime classic, “It’s A Wonderful Life” (1946, Albertson played the role of Sam Wainwright and Hinds played the role of “Pa” Bailey). Still collage of photos from “Man-Made Monster” (1941), as published in the Independent Exhibitors Film Bulletin. According to the American Film Institute’s database article on “Man-Made Monster,” there were several original working titles for Waggner’s Universal monster feature; including “The Mysterious Dr. R.,” “The Mysterious Dr. X.” “ The Human Robot” and “The Electric Man” (Waggner’s film was adapted from an original short story that was written by H. J. Essex, Sid Schwartz and Len Golos, which was also titled “The Electric Man”). 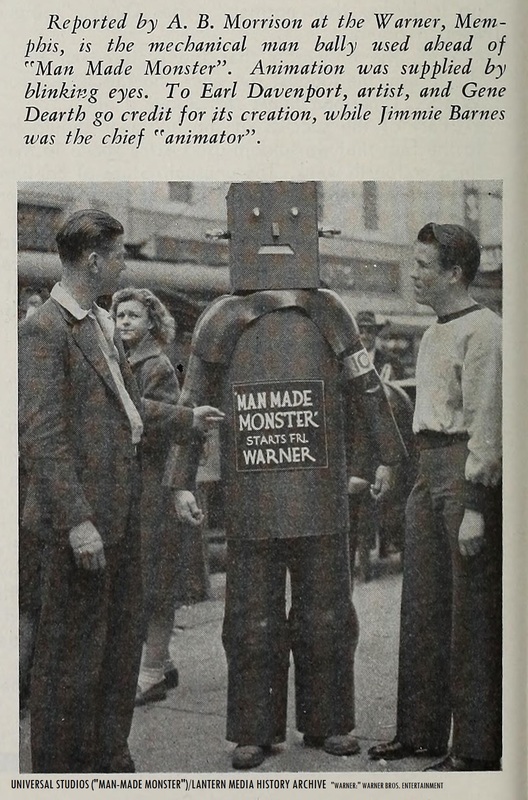 According to the May 1941 edition of “Motion Picture Herald,” the Warner Theatre in Memphis, Tennessee (owned by Universal’s rival, Warner Bros. until the 1948 anti-consent decree where studios were forbidden to own theaters throughout the nation) showcased the Universal-Waggner production of “Man Made Monster.” To promote the release of the film, the Warner-owned cinema house sent out theater official Jimmie Barnes dressed as a mechanical robot-like figure with “blinking” eyes. Memphis’ Warner Theatre was sold in 1968 and was later demolished, according to Cinema Treasures. 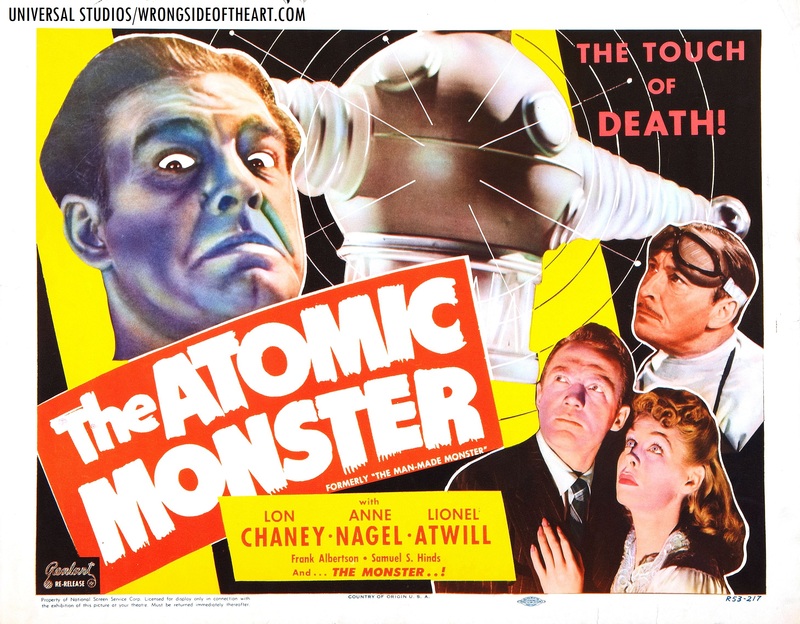 Waggner’s pre-“Wolf Man” Universal monster thriller was re-issued theatrically by Realart Pictures in 1951, under the title of “Atomic Monster;” according to the AFI database. 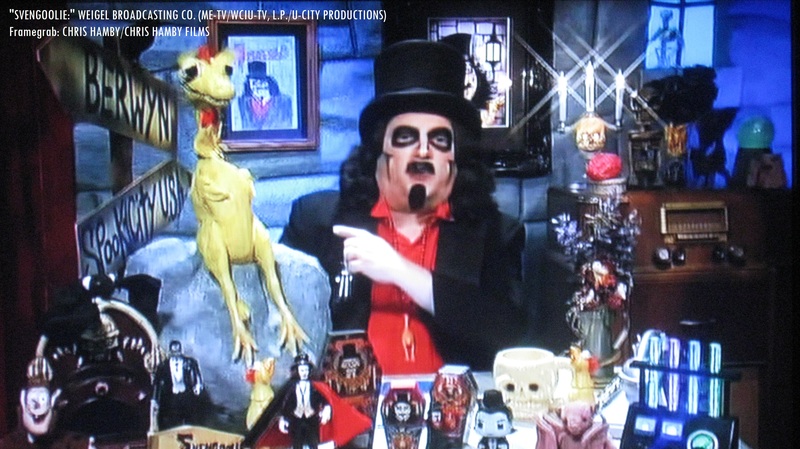 Watch or record Svengoolie’s showcase of “Man-Made Monster” (1941), this Sat. on Me-TV! 1941 Universal Studios publicity still for “Man-Made Monster,” with Lon Chaney Jr., Anne Nagel and Lionel Atwill. Svengoolie (portrayed by Rich Koz) and Kerwyn are ready to for the arrival of the “Man-Made Monster” (1941) this Sat.! Be sure to watch or record Svengoolie’s upcoming showcase of “Man-Made Monster” (1941), this Sat. on the airlanes of Me-TV! With the junior Chaney, an ensemble cast along with Sven’s additional fun facts, Doug Graves’ tune of the evening and Kerwyn’s famous “mail call” segment, you won’t want to miss out on the big broadcast! Highly recommended to all fellow SvenPals and fellow aficionados of classic Universal monster features from coast-to-coast! Join in on the fun with all fellow #Svengoolie SvenPals from coast-to-coast during Sven’s presentation of “Man-Made Monster” (1941) on Me-TV via Twitter! Svengoolie was recently mentioned in Joseph Tarzia’s NewsCred article on how web content marketers/creators can be inspired by the legendary Chicago/Berwyn-based horror host! 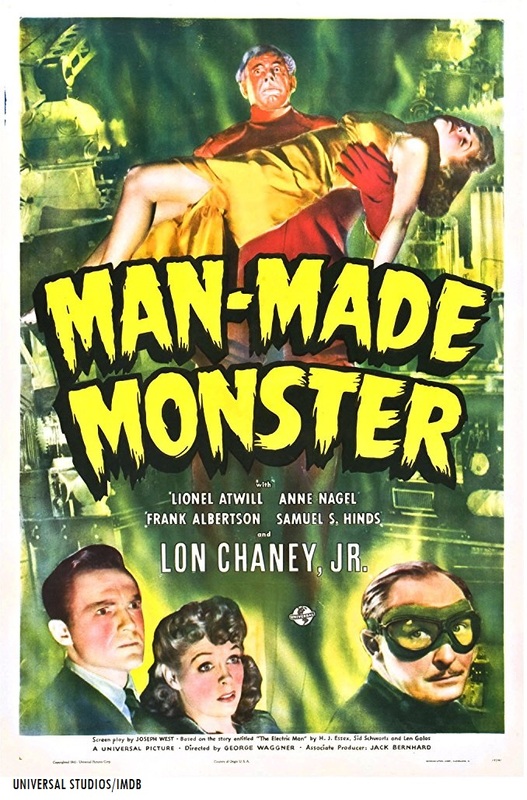 “Man-Made Monster” (1941) is also available on DVD in Universal’s “Vault” series of rare and hard-to-find feature films. Questions/comments about “Svengoolie” or “Man-Made Monster” (1941)? Drop a line at the comments section! I was surprised to read director George Waggner also directed one of my favorite Universal Monster movies (which also starred Lon Chaney, Jr.), “The Wolf Man” (1941). This got me curious about his other films as director and I noticed on IMDB that Waggner also directed the Comedy/Mystery/Thriller “Horror Island” (1941) for Universal. Both “The Wolf Man” and “Horror Island” were released on the same date (March 28, 1941) and with running times of 59/60 minutes respectively, I’m wondering if they ran as a double bill? Even though “Horror Island” (despite the title) isn’t a horror movie, I’m wondering if Svegoolie would be able to air it on his show? Keep up the great Svengoolie movie posts, Chris! Greetings, Gregory! Glad you enjoyed my recent blog post article on Svengoolie’s upcoming showcase of “Man-Made Monster” (1941)! Universal might be working on a new restoration transfer of the film for television syndication (though I did hear that the film is available on DVD through Universal’s manufactured-on-demand “vault” series: https://www.uphe.com/movies/horror-island).